Last week, news circulated widely that two artists (Nora Al-Badri and Jan Nikolai Nelles) had surreptitiously scanned the bust of Nefertiti in the Neues Museum in Berlin and publicly, freely released the 3-d scanning code to enable reproductions of the bust either virtually or with 3d printers. Today, a tweet from Melissa Terras alerted me to newly raised questions about the source of the 3d scanning data released by Al-Badri and Nelles. Fred Kahl, an artist who has spent a fair amount of time on 3d reconstructions and printing of historical objects, argues on his blog that the Nefertiti Hack code could not have been produced from the Xbox Kinect scanning method visible in the video the artists also released of Al-Badri surreptitiously scanning the bust at the museum. I am not a 3d scanning and printing expert, but the critique seems quite valid to me; read the whole post for the details. Also check out Paul Docherty’s post raising the same questions. Docherty is a 3D graphics expert, most notably working on a side project reconstructing ancient Amarna — the capital of Akhenaten and Nefertiti’s period of rule in Egypt. He’s also 3D modeling the Nefertiti bust. Docherty’s and Kahl’s assessments of the high quality of the Hack Nefertiti code lead them both to ask: was this code produced from a physical scan of the object? or was the Museum’s server server hacked and the Museum’s 3D scan code stolen and modified and then released? As Kahl, notes, the museum must have the code on a server somewhere, because it sells individually-produced, painted replicas of the bust on the museum shop website — for €8900! 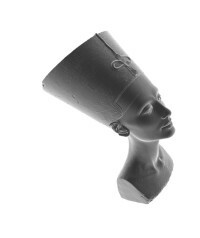 Screen shot of the Neues Museum page selling individually manufactured painted replicas of the Nefertiti bust. This speculation—and that’s really all it is at this point, albeit quite compelling speculation—raises a host of legal, ethical, and political questions. Hacking a server and stealing files is of course illegal. So there are obvious legal reasons anyone who hacked a server would want to present the source (provenance?) of the code as something else. But I think there is more going on here than the strict legality of it all. The framing of this guerilla, post-colonial activism as digital theft or digital repatriation has political and ethical consequences. The popularity of the story when it was released shows that the narrative of cultural repatriation was a sympathetic one. Would the discovery that this scan was stolen from a server and not physically scanned on site shift public sentiment about the artists’ actions? Docherty’s conclusion to his blog suggests it might: “I applaud Al-Badri and Nelles for making this project and their ideology behind it and I really do hope that they have been honest in ‘recording’ their endeavour.” Is stealing the code from a server less honest than sneaking a scanning device into a museum that bans photography of the exhibit? The physicality of scanning the object itself seems an important part of the narrative. I would argue that this embodied act was a central element to the understanding of these events as just. Visiting the Egyptian object in its European location, physically scanning it, physically printing it, and then physically burying, discovering, and displaying it in Egypt all are scenes in a political performance art piece. A very powerful performance art piece. 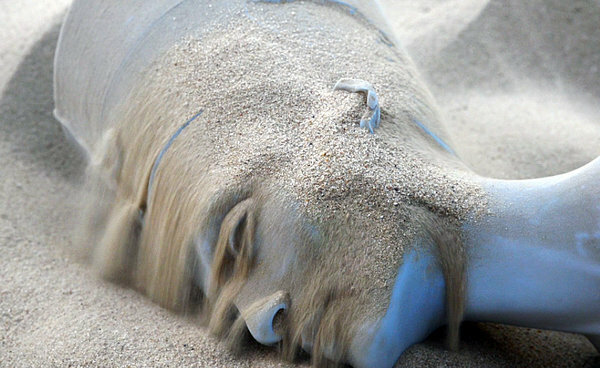 3D printed Nefertiti reburied in the sand. Via the New York Times. What counts as theft here? The removal of the bust from Egypt? The physical scan? Hacking a server? Taking photographs in the Nefertiti exhibit is banned, but you can find such illicit photos and videos all over the internet. Hacking a server, however, most definitely counts as theft. What counts as theft here? The removal of the bust from Egypt? The physical scan? Hacking a server? The physicality of the process and the physicality of the repatriated replica both speak to the importance of the materiality of the object in this cultural heritage debate. The stakes for stealing code speak to something else. The New York Times article summarizes the debate about antiquities repatriation in a way that reflects a popular understanding of it as an argument between the rights of the original nation of the object’s provenance and the rights to “universal” heritage preservation. “Opponents of repatriation make the further case that as the centerpiece of the museum’s collection, the bust is secure and accessible to millions of visitors from across the globe who are able to view it in the context of one of the world’s great antiquities collections.” This take on “Museum’s side” of the debate, so to speak, privileges the access of Western tourists and scholars over the heritage claims of Egyptians. Both of these claims have economic consequences. Most obviously, the tourist industry in Egypt has been, until recently, one of the primary engines of the Egyptian economy. Repatriation of the bust or the Rosetta Stone would contribute directly to the economy of Egypt. The European claims are neither economically nor politically innocent. Although often framed as a public good—the accessibility of the object promotes scholarship or global understanding—objects like the Nefertiti bust have been integral to European colonial practices. On the Nefertiti bust alone, Claudia Breger‘s work has demonstrated the role of the bust in 1930’s German propaganda. The bust was publicized in ways that reinforced rhetorics of German imperial fantasy to promote a German national identity. Can Bilsel’s book Antiquity on Display also examines the intersection of museums, archaeology, and German national politics. Digital repatriation is sometimes cited as a solution to contests over physical repatriation. The argument runs along the lines of: “Protect” the original object by allowing it to remain in the colonial museum, and use digital technology to return it to the people who claim its original cultural heritage. As the papers in the symposium “After the Return: Digital Repatriation and the Circulation of Indigenous Knowledge” (subsequently published in the Museum Anthropology Review) reveal, digital repatriation is insufficient and often fraught, sometimes raising new problems as it seeks to solve old ones. As this episode tells us, the materiality of these cultural heritage objects holds meaning that cannot be extracted into bits and bytes. I would point to some of the recent trends in 3D scanning as potential new sites for digital colonialism, not just repatriation. Is prosecution of stolen code related to contested heritage objects a form of digital colonialism? Is keeping the code private, accessible only to the museum or scholars who obtain access a form of colonialism? Is publicly releasing the code while holding tight to the physical object reinforcing colonialism? As this episode tells us, the materiality of these cultural heritage objects holds meaning that cannot be extracted into bits and bytes. This entry was posted in Digital Humanities, RELI104 and tagged 3D reconstruction, cultural heritage, digital humanities, Egypt. Bookmark the permalink. A colleague on Facebook alerted me to a March 8 post by Cosmo Wenman a 3D scanner and artist who works in cultural heritage: “The Nefertiti 3D Scan Heist is Now a Hoax”: https://cosmowenman.wordpress.com/2016/03/08/the-nefertiti-3d-scan-heist-is-a-hoax/. Wenman, like Paul Docherty, argues that the scan released by the artists Al-Badri and Nelles is derived from the Neues Museum’s own data, their own scan. Wenman asserts that the artists, museum, and the New York Times have all been deceived by a third party — the person who gave the artists the Kinect and then “produced” the scan. He frames it as a hoax. I think the debate swirly around the provenance of the data points again to the importance of the physical object and its provenance. Why does it matter to the political claims of this act of releasing the scan’s code that the code comes from the museum or from artists who were physically in the museum? Wenman, I think correctly, notes the importance of provenance of data. What strikes me is the use of the terms “hoax” (and “heist” and “hack”, as here: http://arstechnica.com/tech-policy/2016/03/one-of-the-greatest-art-heists-of-our-time-was-actually-a-data-hack/). Is it somehow less politically meaningful if the code for the 3D scan has been stolen vs scanned by the artist-activists on site? Is the code less legitimate? Or is this an issue of intentionality, where a 3rd party who may have deceived the artists and the public has now tainted the incident? I completely agree with Wenman on the obligations of museums, especially with colonized artifacts.